Does it matter how "death" is defined, and who defines it? Hello, and welcome to Human Exceptionalism. Most people understand the word “death” to mean the end of biological life, but now an influential cadre of utilitarian bioethicists wants to redefine it to include a subjective and sociologically based meaning. Their purpose isn’t greater scientific accuracy; rather, by making death malleable, they hope to open the door further to treating indisputably living human beings as if they were cadavers. Hello and welcome to Human Exceptionalism. Today we’re going to talk about the cheery topic of death. 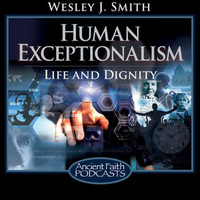 Wesley discusses "transhumanism"—what is quickly becoming the world's newest religion, offering adherents the kind of hope once within the exclusive province of faith and without the humbling concept of an omnipotent God to whom one owes prayer and thanksgiving. Supporting another's self-destruction is not a compassionate or morally neutral act. If you think it is respectable to consider babies, whether born or unborn, to be an inferior stage of human life, you can easily come to think that they have few rights that fully developed persons are bound to respect. Two items in the news lately have captured Wesley's attention. This episode is rated M for mature audiences. We will be discussing some of the darker cultural trends in contemporary society in an explicit manner with very frank descriptions involving abortion and killing people for there organs. If you find these subjects too upsetting you may want to skip this episode.